A gold jewel which is at least 6,300 years old has been discovered by archaeologists excavating the Solnitsata (i.e. “The Salt Pit”) prehistoric settlement, which has been dubbed “Europe’s oldest prehistoric town”, located near the northeastern Bulgarian town of Provadiya. 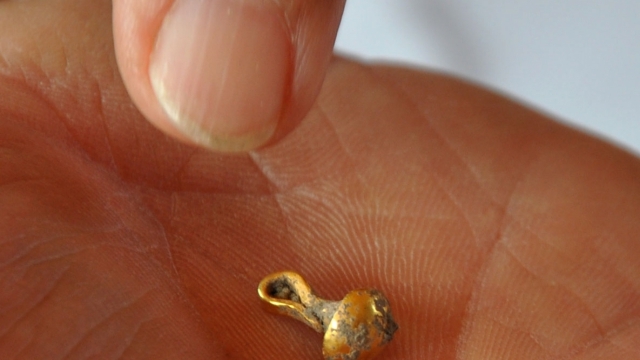 The sophisticated gold jewel has been found by the team of archaeologist Prof. Vasil Nikolov from the National Institute and Museum of Archaeology of the Bulgarian Academy of Sciences in the necropolis of the prehistoric town near Provadiya. “This is the first time we have found gold here. 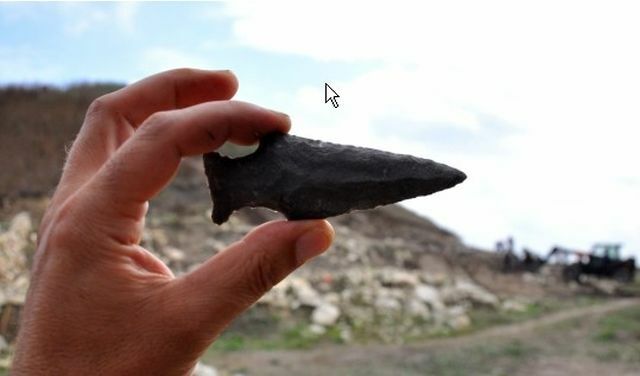 But we also have hundreds of other new finds,” says Prof. Nikolov, as cited by the Bulgarian daily Standart. The gold jewel from the Solnitsata weighs about 2 grams, and appears to be made of 23-24 carat gold. 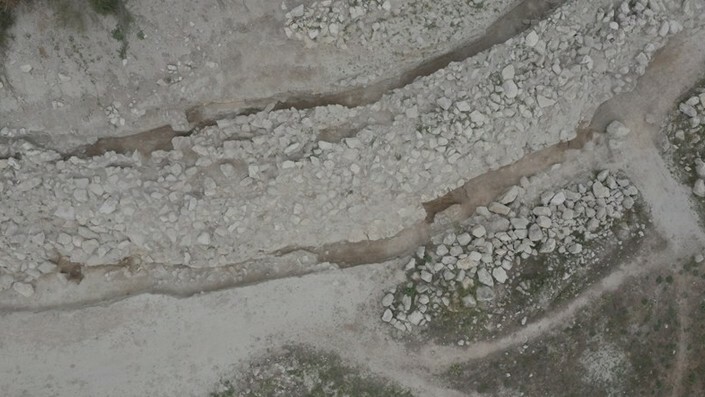 The necropolis of the The Salt Pit prehistoric town is dated to around 4,300 BC, i.e. 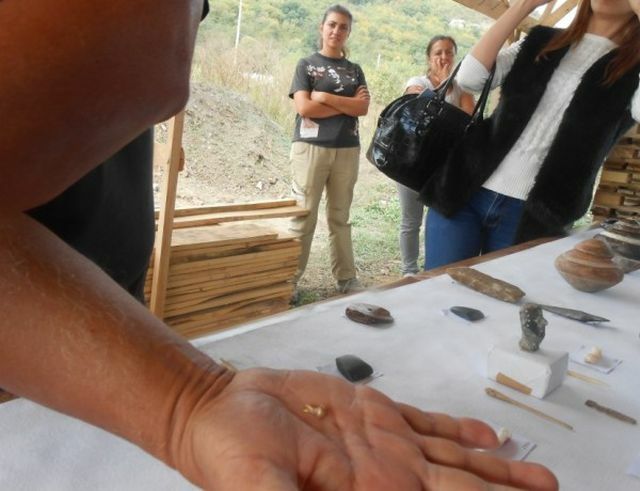 the Late Chalcolithic Period, but Nikolov believes the gold could be 200-300 years older. 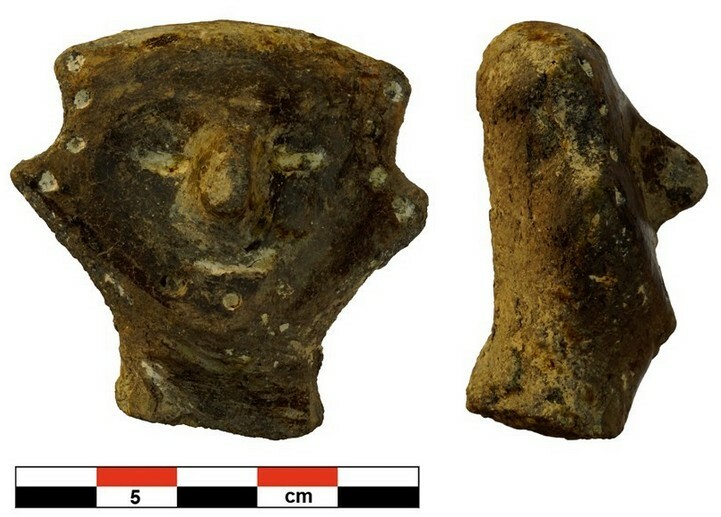 It is unclear whether the gold jewel found near Bulgaria’s Provadiya was worn by a woman or by a man, in order to signify his high social status. As a work of prehistoric art, the jewel from The Salt Pit rivals the gold treasure artifacts of the Varna Chalcolithic Necropolis (4,500-4,200 BC), the oldest hoard of processed gold found in the world, which is located near Bulgaria’s Black Sea city of Varna, 37 km to the east of Provadiya. 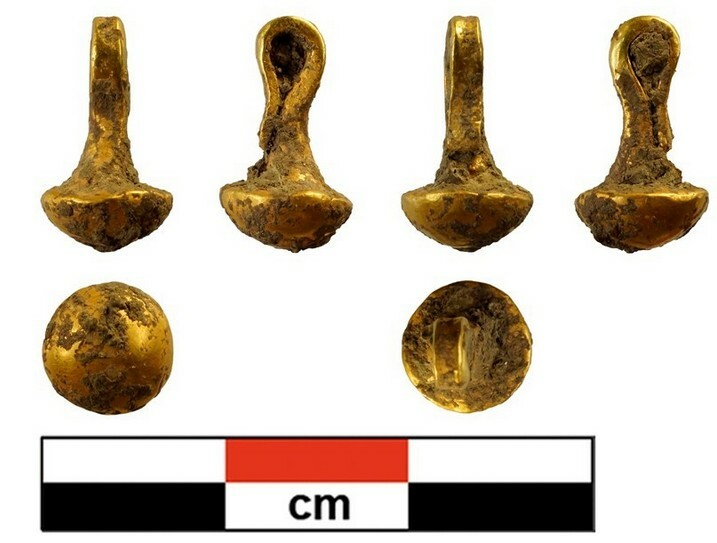 The newly found gold jewel and its similarity to the items from the Varna Chalcolithic Necropolis appear to confirm the hypothesis of Prof. Vasil Nikolov that the region around the Varna Lake and the Beloslav Lake in today’s Northeast Bulgaria was inhabited by a complex prehistoric society. This prehistoric society specialized in the production of salt which was exported to distant markets. The salt production boosted trade, and salt itself was probably used as a currency at first, before the arrival of gold. “There used to be a highly developed civilization on these territories. It was concentrated in two locations. There was a major center for the processing of copper and gold near the Varna lakes, and here, in the prehistoric settlement Solnitsata, there was the extraction of salt. This society developed for about 200-300 years,” explains Nikolov, as cited by the Cherno More News Agency. “What’s interesting regarding the gold jewel that we have found now is that it was discovered not inside one of the graves but between them, which might testify to some kind of a more special ritual. In any case, this jewel is another specimen of the art of jewelry making that was developed at the time,” the lead archaeologist elaborates. He notes that the term “jewel” might not be the most precise one for the gold item found near Bulgaria’s Provadiya because it was not worn as a decoration but as a status symbol. 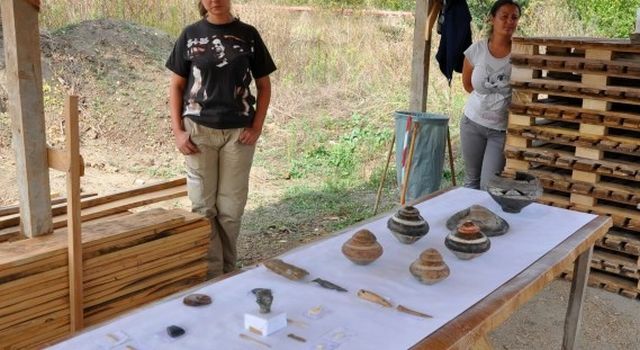 While the new prehistoric gold find from the Solnitsata prehistoric town is impressive, Nikolov says the fortress of the settlement itself is much more important. The stone fortress of The Salt Pit town near Provadiya is dated to 4,700 BC, which makes it 6,700 years old, and the oldest stone fortress in Europe. For example, when compared with the legendary city of Troy, which was founded around 3,000 BC, the Provadiya – Solnitsata stone fortress is at least 1,500 years old. 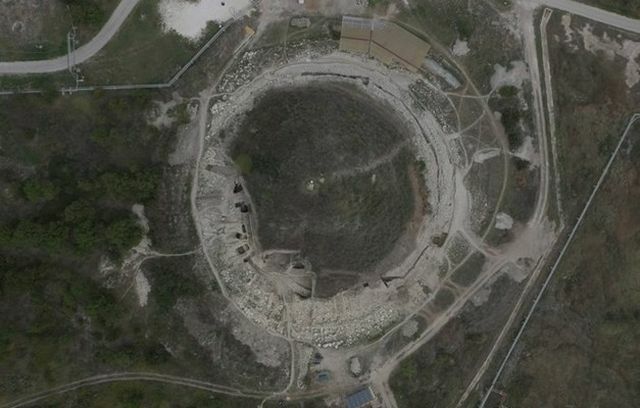 “The [fortress] wall that we are unearthing right now shows that the fortress had a shape of a circle with a diameter of about 90 meters. It is interesting that back then the people had valuable knowledge about military affairs. In order to ensure a better defense, the wall was not made round but its sections follow straight lines. That’s because the round shape would have been harder to defend. 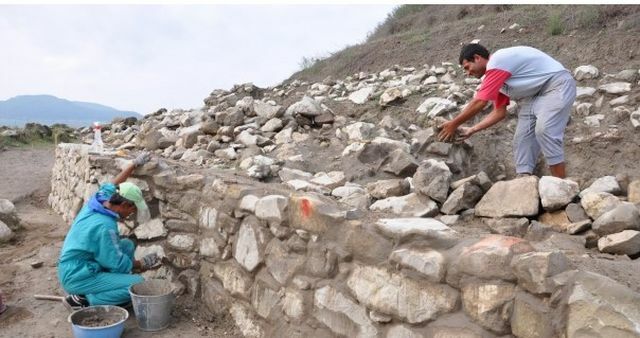 The fortress walls have impressive foundations which are about 4 – 4.2 meters wide, and reach a height of about 6 meters,” Nikolov is quoted as saying. “It is even more interesting that the settlement has two-storey houses made of wood and clay, or of stone. We still don’t know where exactly the entrance of the fortress was located,” he adds. 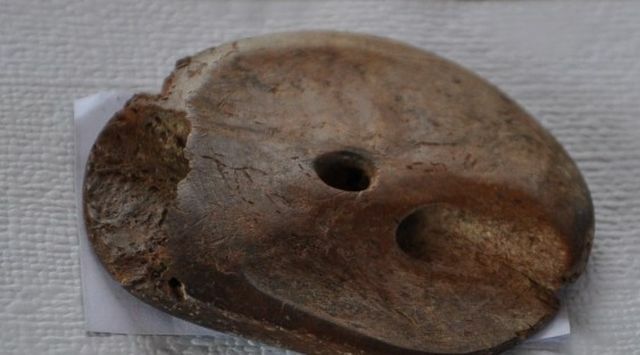 Nikolov, who has been the lead archaeologists of the Late Neolithic and Chalcolithic settlement near the town of Provadiya in Northeast Bulgaria since its discovery in 2005, has reminded that samples from skeletons found in the Provadiya – Solnitsata settlement have recently yielded “surprising” results: they have indicated that the people who lived there in the 5th millennium BC consumed milk long before it had been thought that humans started to use the milk of domestic animals. 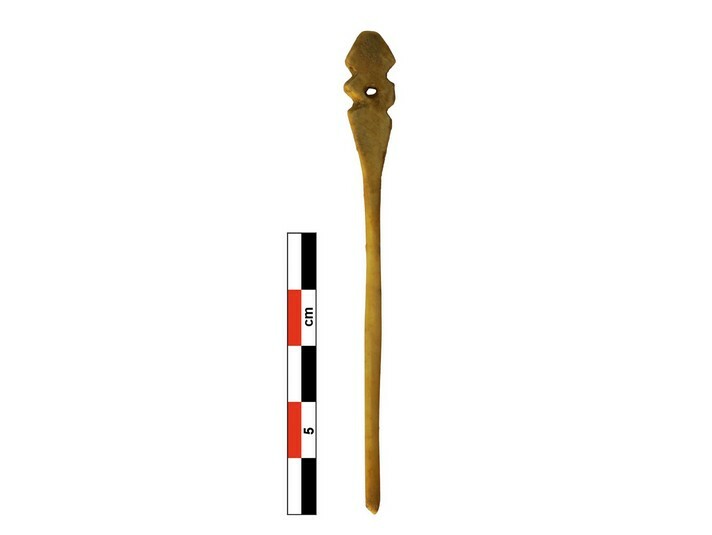 In addition to the Chalcolithic gold jewel, the archaeologists conducting the excavations at The Salt Pit have found lots of arrow tips and a spear, bone decorations, and an intact bone idol which could become an emblem of the Bulgarian town of Provadiya once it is fully studied. The arrow tips and the spear found near the fortress wall mean that the place was the arena of fierce battles. The 2015 summer excavations of The Salt Pit settlement near Provadiya have been funded with the meager sum of BGN 14,000 (app. EUR 7,200) by the Bulgarian Ministry of Culture. 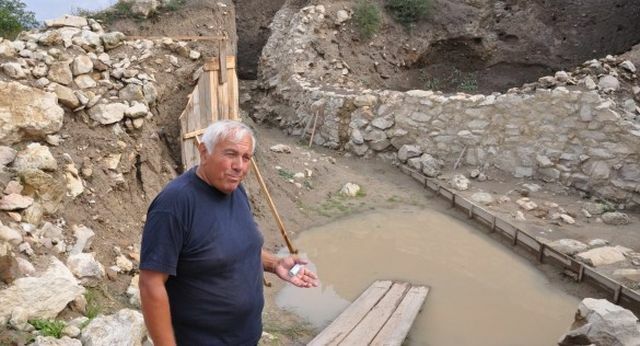 Lead archaeologist Vasil Nikolov says he would not have even started any digs in 2015 because of the insufficient government funding, had it not been for the support of the private firm Provad Salt which owns the property where The Salt Pit prehistoric town is located. The archaeologist points out that a lot more prehistoric artifacts are to be found if the entire mound covering The Salt Pit settlement gets excavated. However, the mound is over 20 meters tall, and that kind of excavations will be really expensive.